In this article we’ll be giving a tutorial on how to use your Philips Respironics oxygen concentrator. You’ll learn all the important details you need to know to run your machine safely and get that supplemental oxygen you need safely. First you’ll want to plug your oxygen concentrator into a working electrical outlet. At the top of your machine on the left side you’ll see an on off switch. The on setting is represented by an (|) symbol and the off setting is represented by a (O) symbol. You’ll turn the machine on. When you first turn the EverFlo Concentrator on all 3 LED lights will light up; A red light, a yellow light and a green light. The red and the yellow lights will only illuminate for a few seconds and then they’ll turn off. If everything is working correctly only the green light will remain on. You’ll also hear a high pitch sound that should go away in a second or 2. If the red light stays on more than several seconds, turn off the concentrator, unplug it, and plug it back into another outlet in about 5 minutes. That should solve the problem but if it persists give us a call. If the yellow light stays lit and the audible alarm continues beeping periodically, it means the airflow to the device is impeded or blocked. Make sure to remove the device away from anything that could be blocking the airflow like walls, clothes, and curtains for example, and make sure there is nothing covering the oxygen concentrator anywhere. You’ll see a couple of vents on the back of the oxygen concentrator and those should be completely free from any kind of blockage. This is where the oxygen concentrator pulls in air to concentrate the oxygen. If those vents are blocked or the flow of air is impeded in anyway, the machine won’t be able to generate the amount of oxygen that you set the liters per minute to. This should make the yellow light turn off, but if it doesn’t make sure none of your hoses are kinked. As long as only the green light stays on, everything is working fine. Your machine will come with up to 2 nasal cannulas. You’ll want to open one of those and connect it directly to the oxygen outlet port at the upper left side of the machine if you’re using the concentrator without a humidifier. Then take the nose piece and gently insert the prongs into your nose, and wrap the tubing around your ears as shown in the image on this page. For 2 people to use the machine at once, you’ll want to connect the extension tube provided with your oxygen concentrator directly to the oxygen outlet port, and you’ll be using the provided splitter (shaped like a Y) to connect to the end of the extension tube. After your Y splitter is connected to the extension tubing you’ll connect the 2 separate nasal cannulas to it. Connect them snugly, but not tight. At the top middle of the machine there’s a flow meter knob where you can adjust the liters per minute of oxygen flow. We’ll be looking at the settings of liter per minute flow for 1 person or for if 2 people are using the machine simultaneously. 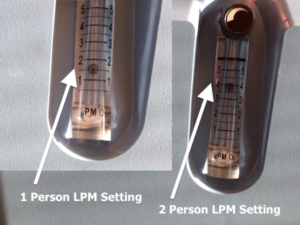 When you turn the flow meter knob it will go up and down depending on the direction that you turn it and that tells you what your liter per minute flow is; going all the way down below 1 liter per minute and all the way up to 5 liters per minute. The only reason you would want to set the liters per minute to a higher setting is if your doctor specifically told you you need more. Then you’d go with the doctor recommendations. For two people using the machine simultaneously you’d want the setting for liters per minute to be approximately 3.5 to 4 liters per minute. Keep in mind it’s also very important for you to reset the liters per minute to approximately 1.5 to 2 L per minute after two people have been using it together and then only one person is going to be using it again. Many people forget this and it’s important to remember. Another important thing to remember is that when you are using your oxygen concentrator with another person, and you go back to using the concentrator alone, or when somebody else is using it alone after 2 people have been using it together, you’ll need to go ahead and remove the splitter and the extra cannula so that only 1 nasal cannula is connected again. Reconnect your cannula with a swivel connector piece if you are connecting to the additional tubing or connect directly to the oxygen concentrator or bubble humidifier. In order to get the right dosage of oxygen as you’ve set it for on your liters per minute setting, you need to have only 1 cannula connected to the oxygen concentrator when only 1 person is using it. 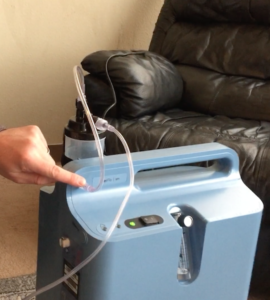 It’s likely a humidifier will be included with your oxygen concentrator rental. Using the humidifier will add a little moisture to your oxygen supplementation. Some people like this and others don’t but it’s good to know how to use it so you can see if it suits you. When you look at the humidifier bottle you’ll see there’s a minimum and maximum indication on it. For best results go a little over the minimum amount but not too much. about 1/3 of the bottle filled with water is pretty good. Distilled water is ideal to use in your bubbler but bottled or purified water is fine if you don’t have easy access to distilled. Once you’ve added water to the bottle, make sure to put the lid on snugly and also also tighten the knob at the top of the bottle where the tube is connected to it, so it’s snug. If the lid and the knob are not snug, you may not be getting the oxygen you think you are. To make sure you are, look at the bubbler when it’s attached to the machine correctly and the concentrator is running. If everything is working correctly, you’ll see the water is bubbling. You’ll also want to make sure your bottle is securely strapped to the back of the concentrator with the velcro strap. In the case that you’re using the humidifier bubbler, the tube coming out of the top of the bubbler will be connected to the oxygen outlet port and your nasal cannula tube will connect to the outlet port coming out of the side of the top of the humidifier bottle. 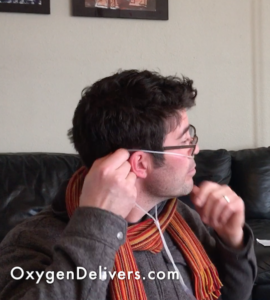 Make sure the tubing is not kinked or restricted in anyway so the oxygen flows properly. Now you know how to use the Philips Respironics EverFlo oxygen concentrator safely and start benefiting from the supply of extra oxygen it produces. Call Oxygen Delivers To Schedule An EverFlo Concentrator Rental! We created the video above in case you wanted the less detailed version of the concentrator operating instructions.